The U.S. statistics on ovarian cancer show almost no progress in eliminating this cancer since 1975. The annual rate of new cases of cancer of the ovaries has remained level in the United States since 1975 with two exceptions: a 0.9% decrease among all women from 1987 to 2004 and a 0.4% decrease among African American women between 1975 and 2004. Since 2004, the rate of new cases every year has leveled off again. As of 2004, there were 20, 095 new cases reported with 14,716 deaths reported (Center for Disease Control). Estimates for 2008 are 21,650 new cases and 15,520 deaths (American Cancer Society). Ovarian cancer is the fifth leading cause of cancer deaths among American women, following lung, breast, colon, and pancreatic cancer. Most women are interested in staying informed and learning ways to promote their own general good health and reduce their risk of diseases. Modifying their diets, adding daily exercise, managing stress, and adding healthy habits are all helpful. One healthy habit that may reduce cancer risk is drinking tea daily. For some time, researchers have been unable to determine if dietary factors including tea, coffee, or caffeine change the risk of ovarian cancer. Now, new ovarian cancer research on black tea and green tea ovarian cancer research show that increasing tea consumption may reduce ovarian cancer risk. The more tea each woman drank, the lower her risk of developing ovarian cancer. *A study from Sweden tracked 61,057 women from the age of 40 to 76 for an average of over 15 years. 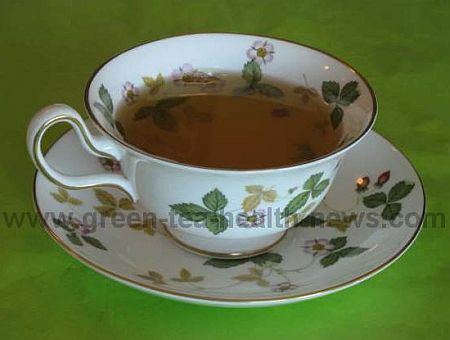 two cups daily showed a reduced risk of 46% compared to women who did not drink tea. Each additional cup of daily tea lowered the risk more. While this ovarian cancer research study included both green and black tea, black tea is most commonly consumed in Sweden. Coffee was not associated with reducing the risk of cancer in the ovaries in this study (Larsson SC, Tea consumption and ovarian cancer risk in a population-based cohort, Archives of Internal Medicine, December 2005). A second smaller study used a hospital-based case-control design and found that drinking two or more cups of black tea daily reduced the risk of primary epithelial ovarian, fallopian, or peritoneal cancer by 30% (Baker JA, Consumption of black tea or coffee and risk of ovarian cancer, International Journal Gynecology Cancer, Jan 2007). Other ovarian cancer research studies have shown that green tea alone may reduce the risk of ovarian cancer by up to 77%, as well as showing effectiveness with drug-resistant ovarian cancer. While a healthy diet and daily exercise help a woman's total health and may reduce the risk of many diseases, early detection of cancers is the best way to increase the survival rate. Every woman should have regular exams and consult with her physician about her lifetime risk of cancer. Ovarian cancer can show up to a 95% survival rate if detected in the early stages while it is still localized. But only 19% of the cases are currently detected at that stage. Increasing your knowledge and information, including diagnostic information, is a great defense against diseases. While learning more and improving your daily habits, you may also want to consider adding daily tea to your diet if appropriate. Can you really buy that informative cancer survival book for $0.01?